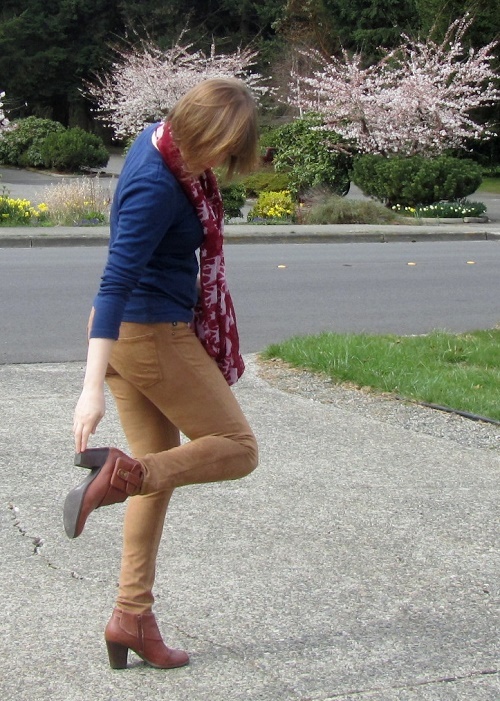 I few weeks ago, before the cherry blossoms blew away in the wind, I debuted my new, faux-suede skinny jeans. I picked these up at a clothing exchange earlier this year. They’re so soft and, well, suede-like. A great example of how you can get the look and feel without the actual skin. Plus, these are stretchy and machine-washable. You can’t say that about suede. I picked up the same brand and style in gray corduroy too. I don’t know who dumped these terrific pants, but thank you! 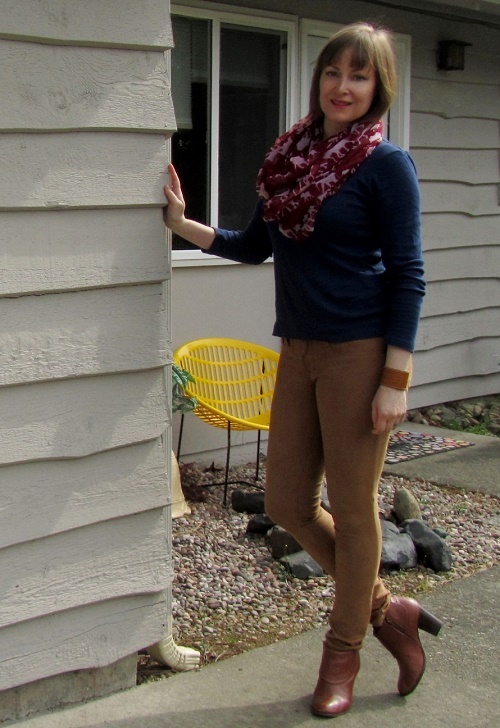 I paired my pants with a simple long-sleeved t-shirt and threw on a scarf. 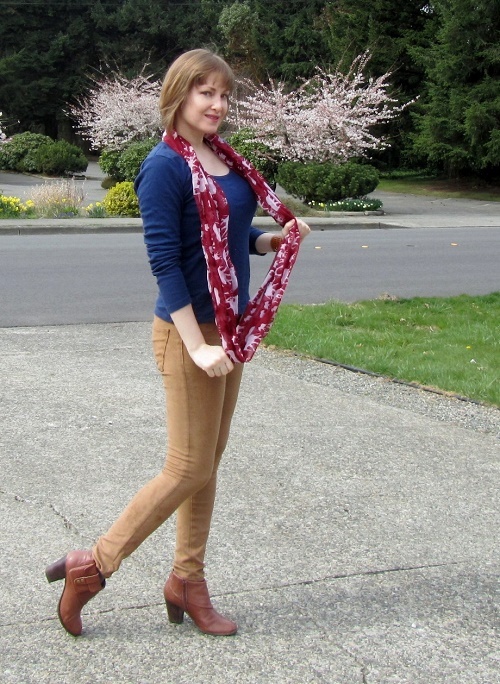 I like the subtle elephant pattern of this scarf. Nothing says spring like a trench coat. 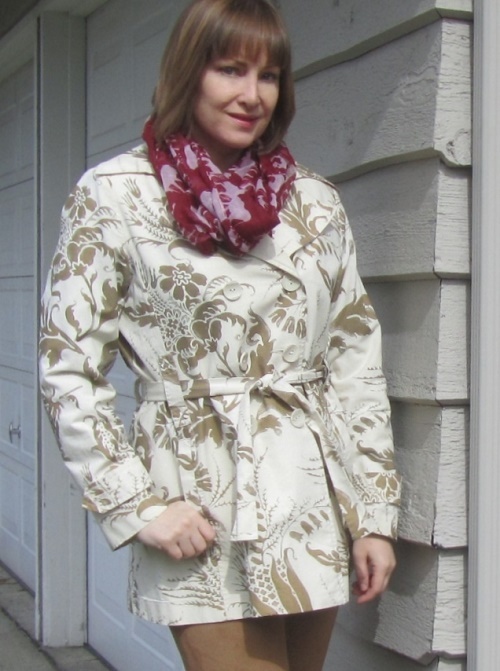 I threw a patterned coat (also from an exchange) over my outfit. It color-coordinated and introduced another pattern, which I like. Great outfit. Just from the picture those pants look soft and comfy. Great find. I love your scarf too. I mean it! LOVE the look! And having hair that short (besides being easy to get ready) makes it great to color too. You’d never have damaged hair and you could change colors whenever you want. Although your natural silver is very elegant!